This recipe right here is why Twitter is so magical. 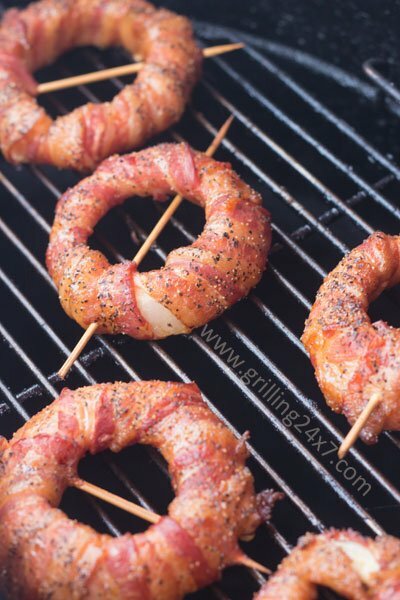 One night I was messing around on it and I noticed that one of my twitter buddies Joe posted a photo of some smoked bacon wrapped onion rings. I have never even considered such a marvelous idea. 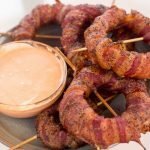 I went to his blog MmmGoBluBBQ.com and I saw his version of these amazing treats. This immediately went to the top of my to-do list. Today I’m going to show you my take on this amazing appetizer. I added spicy sriracha hot sauce and make a spicy mayo dipping sauce. I could only imagine how amazing these would be at a tailgate and it for sure rivals one of the best smoked appetizers ever – the smoked stuffed jalapeno pepper. Yeah, these are that good! These were absolutely phenomenal and I will certainly make these over and over again. This just might be my new go to appetizer recipe. Fantastic!! 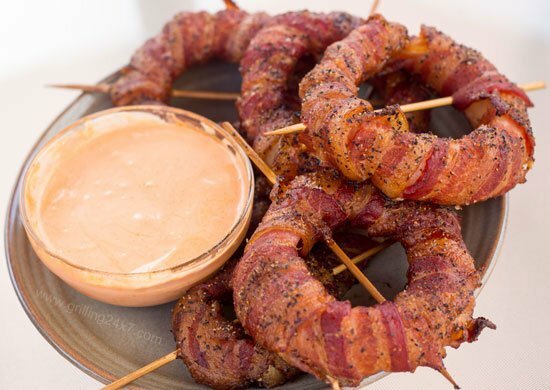 The original smoked bacon wrapped onion ring recipe with sriracha dipping sauce. 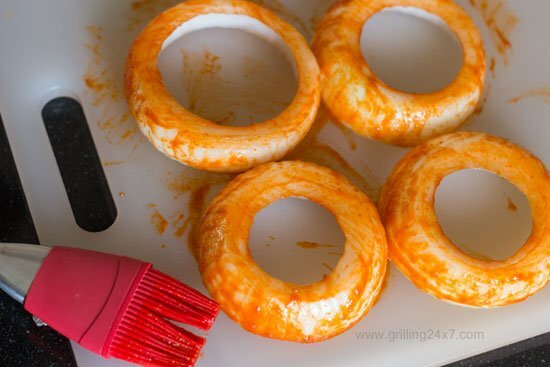 1.Cut onions into 1/2 inch thick rings and pop the internal rings out until you have a nice sturdy onion ring. 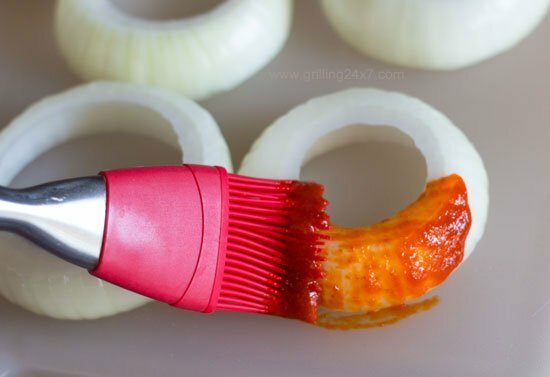 2.Brush onion with hot sauce. 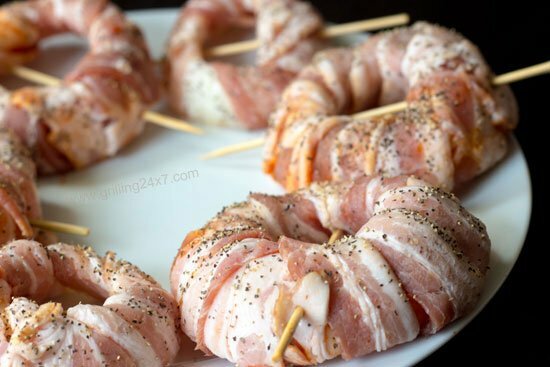 3.Wrap each onion ring with bacon and secure with a skewer or toothpick. 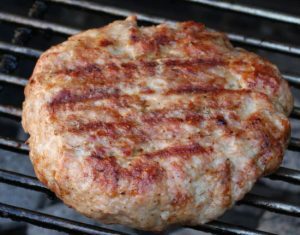 4.Heavily cover the onion rings with pepper and smoke, grill or bake for about 90 minutes at 250-350 degrees. 5.To make the spicy sriracha mayo, combine 2 T of mayo, 1 T of sriracha sauce, and 1 tsp of lime juice. Mix well. 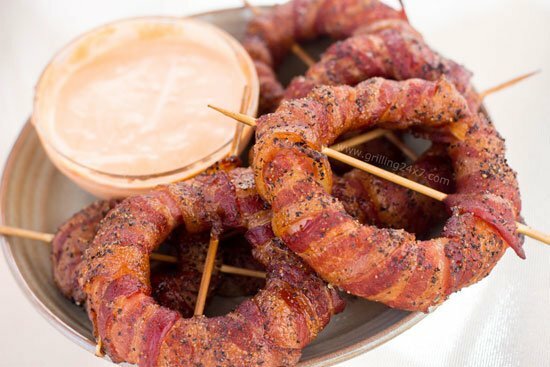 Instead of grilling my bacon wrapped onion rings for 90 minutes I microwave the onion on full for about 20-25 seconds let it cool then wrap it, grill for 25-30 minutes then enjoy. Wow, I thought I saw it all until now. 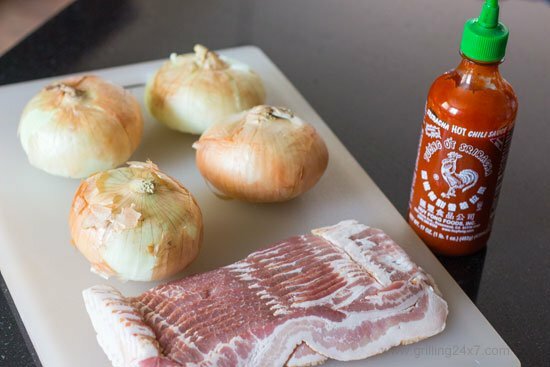 You had me at bacon but then Sriracha. My all-time fave sauce. Bravo! Looks awesomely yummy! Can it be made in the oven? If yes, what temperature setting would I use? could you make these ahead them freeze them and cook them later??? great recipe…i just love bacon so much! I thought I’d skimp and save some money by only putting 1 and a half pieces of bacon on each ring….wrong! TOTALLY should have listened to you and did the 3 pieces. Most if them feel apart. But still delicious all the same. Just not as pretty. Great recipe! Thank you! I’m sorry sir but I was excited to find this Web site went straight to what I’ll call the home page, had a pic of a big Ole burger on right side with menu next to it in reads in beef, Pork , chicken, appetizers, etc. I have been looking for 15 minutes how to get back to that page with no luck. If your Web site is this difficult to navagate, I’ll get my smoking, q’ing, recipes elsewhere. Thought I found a great Web site till I tried to find my way around. Shouldn’t need a degree to get info from a Web page. A new favorite for special occasions. 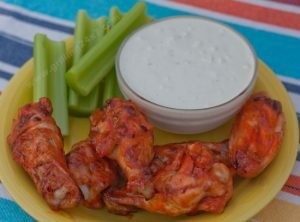 I made a dipping sauce out of mayo/garlic chili sauce and a dab of maple syrup….Soooo Good!!!! We have been making these for a few years now, after having seen this recipe. After making them the first time, I wondered how they would be with the onion coated with BBQ sauce instead. I love Sriracha, but have to say the ones using BBQ sauce are our favorite now. I sometimes mix Sriracha with BBQ sauce as well. You do have to be careful, since the sugar in the BBQ sauce will brown more than wth just the Sriracha. 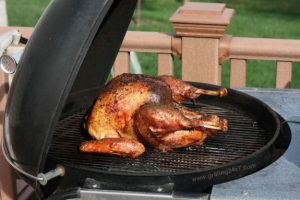 If I rinse my hands well after applying the BBQ sauce, and handle the bacon carefully, I don’t get BBQ sauce on the outside as much, so it isn’t as much of an issue. We still make the dip the same. Both are great, thanks for the recipe.